As if the Wii wasn't fun enough already, now you can add LEGO toys to the experience. Let's be honest about something: LEGO toys are cool, and cool stuff gets coolerwhen you add them to the mix. Nintendo and LEGO have recently joined forces to create a LEGO-oriented Wii Remote, and the results is - unsurprisingly - simultaneously garish and pretty dang cool. 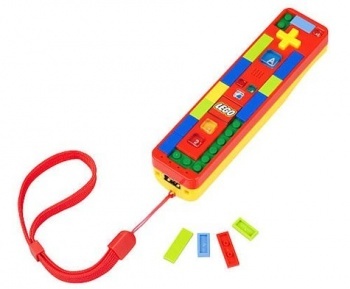 According to Toys 'R' Us, the custom controller comes with all the standard features of a Wii Remote, but also includes 31 Mini LEGO tiles and a Tile Seperator. On top of that, you can "use your own official LEGO pieces (not included) to build a custom display stand using the Buildable Battery Cover." Currently, the LEGO Wii Remote seems to be a Toys 'R' Us exclusive, and it's a little more expensive than the standard model, though not outrageously so ($39.99 compared to $35 for the regular version). Growing up, I was a LEGO kid who always loved building insane pieces of architecture. I can only imagine how much fun people will have creating custom holders (and maybe Wii display cases - hint, hint) to go along with this cute little piece of kit.